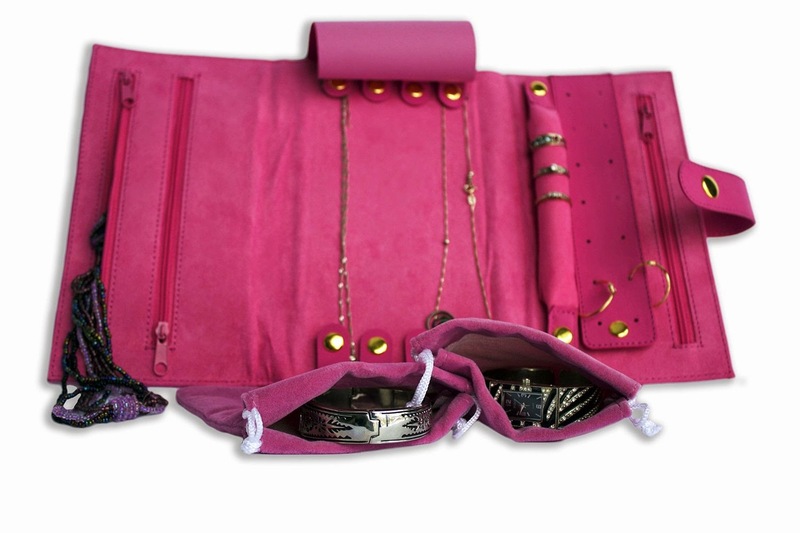 TRAVEL: Now you can carry all of your favorite jewelry in one place when traveling or on the run. Our compact design allows you to conveniently (and safely) keep a Jewelry Roll in a purse or bag instead of your suitcase. Worried about not packing enough clothes? With so much capacity to hold items, it's also perfect for that long vacation or cruise where you need to bring lots of accessories to make variations out of a skimpy wardrobe! BETTER-THAN-MONEY-BACK GUARANTEE! Order now with peace of mind. If you are not 100% satisfied, tell us and we'll give you a full refund, no questions asked! 100% CUSTOMER SATISFACTION GUARANTEED! See product description below for more information. QUALITY | PROTECTION: Don't fear; your treasures are safe! Specialty Style's premium quality materials and craftsmanship provide a product that will last for years and protect your jewelry throughout. Quality fabric will maintain its delicate feel and will not crack or harden over time as less expensive products do. We understand your jewelry is valuable and our design intentionally separates items to prevent scratching, tangles or wear. 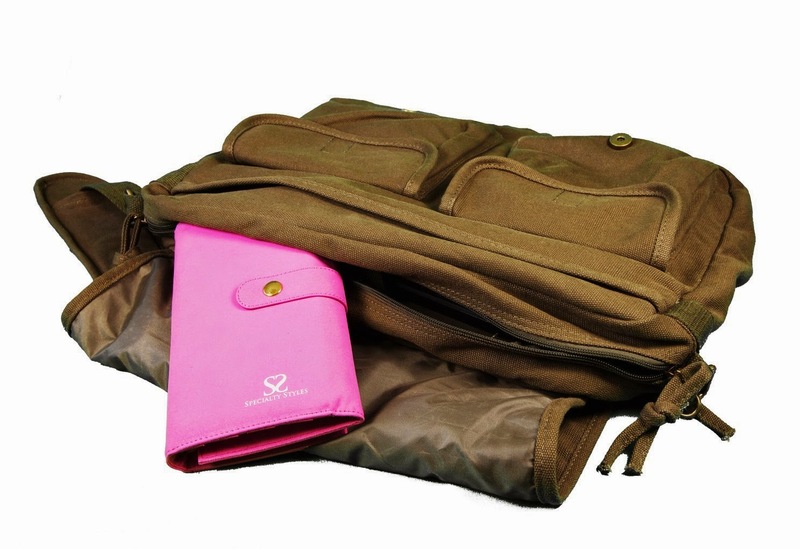 With a quality, snag free zipper there will no longer be loose items wandering your bag. ORGANIZE | SAVE SPACE: With separate compartments for rings, necklaces, earrings and more, you now have ONE place to keep everything. Our well thought out design and 5x8 inch roll saves you space while also making items easily visible and tangle free. But what about bracelets and watches you say? As a BONUS you also receive two free pouches for storing large pieces which would otherwise prevent your Jewelry Roll from being compact. For convenience, these can also be latched to the main item (see pictures). TANGLE FREE: No more tangled necklaces or rings and ear rings bouncing around in a box! 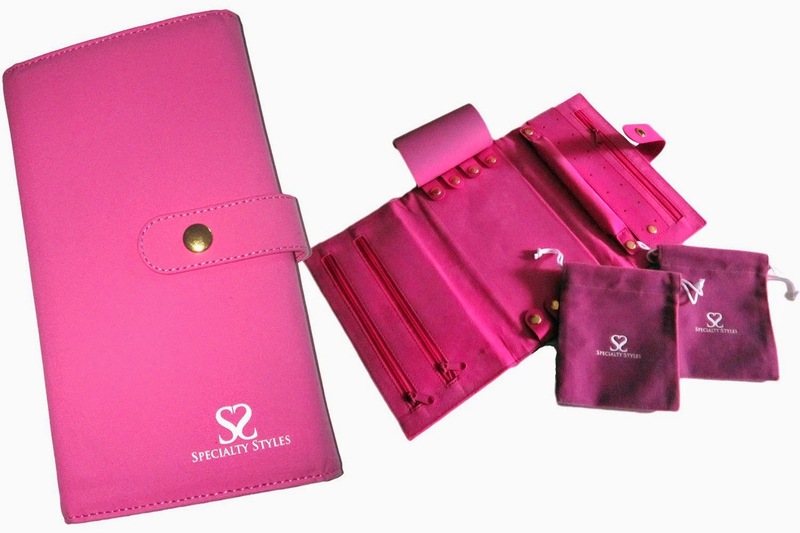 This travel organizer protects and secures your precious jewelry. Using double clasps, your necklaces are neatly tight and straightened while rings fit snug over a soft fabric tube. For extra protection, a protective cover also lays across your necklaces to prevent scratching while they are held in position. With everything fitting nicely in its own place, the item rolls up without anything squashing or falling out. With your treasures safe and organized you're travel time is now worry free! We realize many customers like to wear bracelets and larger jewelry pieces so we have included these with your purchase. The strings on the pouch can be placed around the closure to keep all your jewelry together. When the Jewelry Organizer is folded up the measurements are 5inW.x 8in.L and about 1in thick. Open Jewelry Organizer is 13in.x8in. 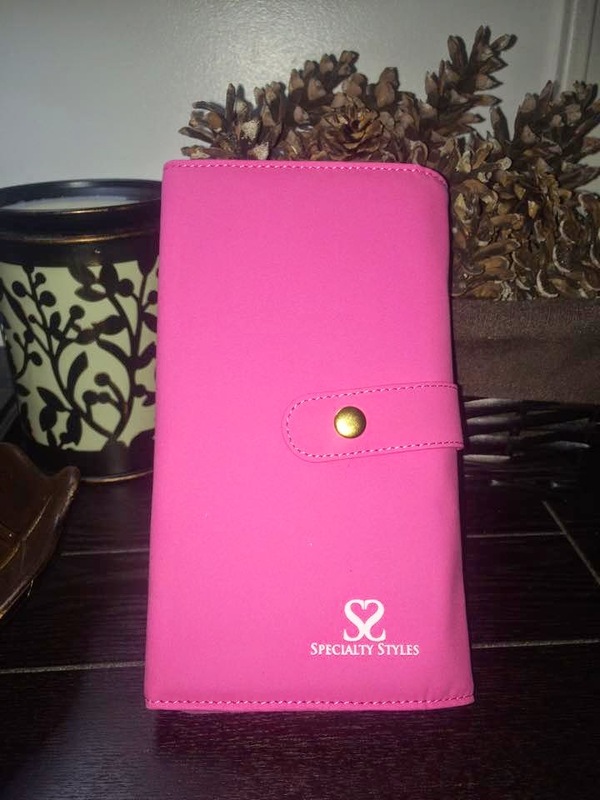 I was so happy to get to try this Jewelry Travel Organizer from Specialty Styles. Firs of all , it is super cute and I love the color, the material is soft, which is nice to keep jewelry. I like that there are several compartments for each type of jewelry with 2 extra draw string bags to keep bulky items. 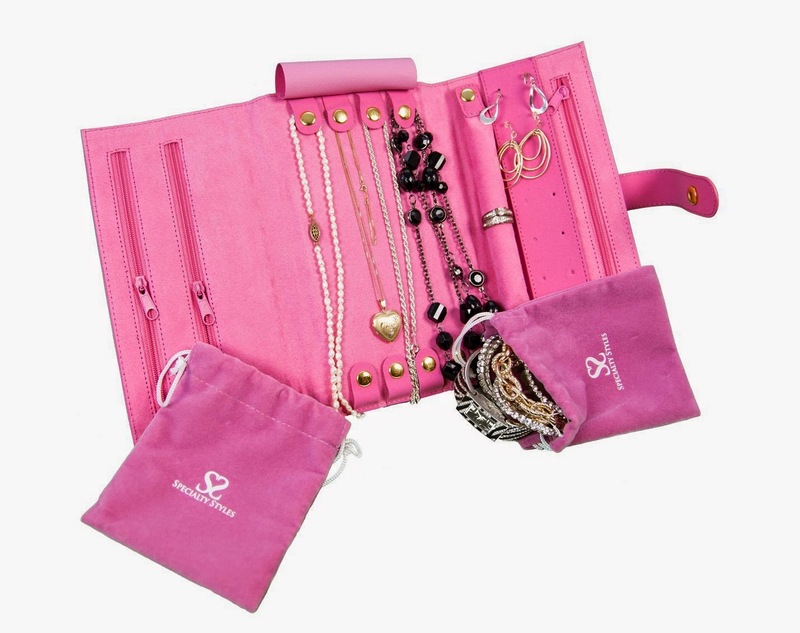 Each compartment snaps or zips securely and really does an excellent job of organizing my jewelry. This is perfect for me when I travel so I can keep all my jewelery with me in this compact case. I like that it has plenty of room for your jewelery but yet it is small enough to put in your carry on bag. 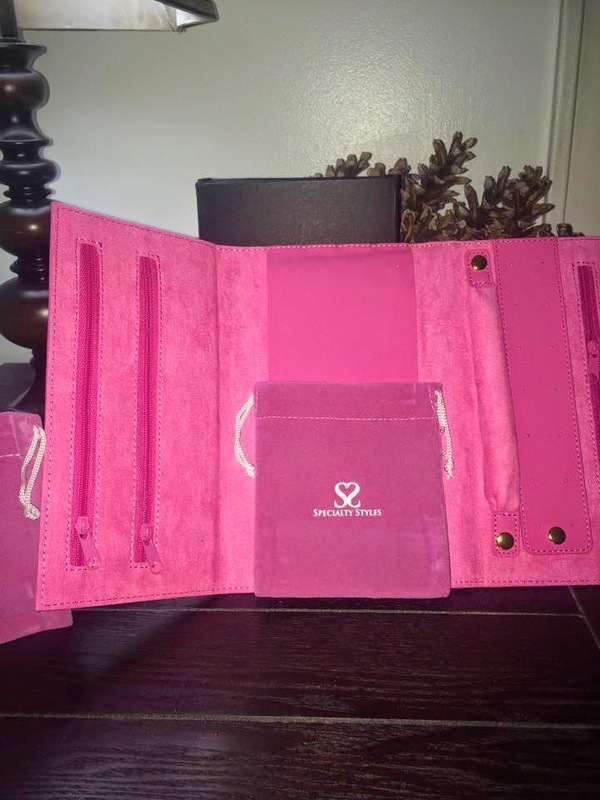 I recommend this travel organizer for your jewelry, even if you are not a traveler, it is a very nice way to keep track of your jewelery. I love how each type of jewelry has a place where it is secure and won't fall out or tangle. 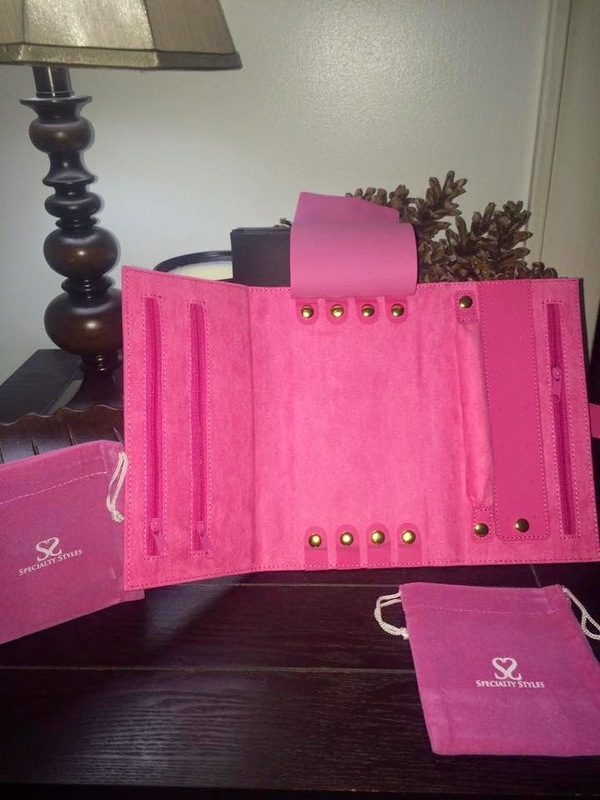 I love the size of this jewelry travel organizer, it hold all my jewelry and fits in my carry on bag perfectly!